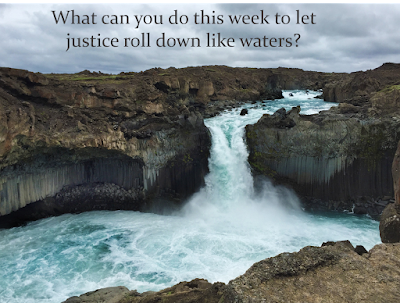 What can you do to let justice roll down? Well, you could participate in one or more of the events being held in Iowa City this week for the National Hunger & Homelessness Awareness Week. #HHAW is an opportunity for communities across the country to engage, educate, and donate to move residents beyond homelessness, and is held each year the week before Thanksgiving. Winter clothing for men and women, personal hygiene items, blankets, non-perishable canned goods. Go to Shelter House website to purchase tickets. And/or you contact your representatives in Washington to advocate for full funding for a number of critical housing programs. HOMELESSNESS ASSISTANCE GRANTS McKinney-Vento Homeless Assistance Grants help fund local and state assistance programs across the country, offering communities the tools they need to provide outreach, shelter, supportive services and more for people experiencing homelessness. Urge Congress to fully fund McKinney-Vento programs for $2.456 billion in FY2018. LOW-INCOME HOME ENERGY ASSISTANCE PROGRAM (LIHEAP) Energy is a critical resource, and as the seasons turn, many low-income people struggle to keep the heat on in their homes. Programs such as LIHEAP give states the funding to help people with low incomes with the highest energy costs meet their heating and cooling needs. Urge Congress to fully fund LIHEAP for $3.39 billion in FY2018. TENANT-BASED RENTAL ASSISTANCE (TBRA) Rental assistance applied in innovative ways gives low-income people the funds they need to find affordable housing and is more fiscally efficient than emergency shelters. TBRA programs provide assistance to individuals to help them afford market-rate housing units. Urge Congress to fully fund Tenant-Based Rental Assistance contracts for $21.365 billion in FY2018. SENIOR HOUSING As the U.S. population ages, lack of affordable housing for seniors has become a critical issue for many on fixed incomes. Supportive Housing for the Elderly funds sponsors and nonprofits to develop and operate affordable senior housing. Urge Congress to fully fund Section 202 Housing for the Elderly for $573 million in FY2018. RURAL HOUSING ASSISTANCE Rural communities face some of the steepest housing challenges in the nation. Lack of development and renovation over decades has resulted in many hidden costs, from rapid physical deterioration, poor insulation, overcrowding and more. Urge Congress to maintain all Section 521 Rental Assistance contracts for $1.405 billion in FY2018. VETERANS HOUSING Homelessness among veterans has fallen by 47 percent since 2010, but it still remains a serious problem. The HUD-Veterans Affairs Supportive Housing (HUD-VASH) efficiently helps veterans connect with case-management and clinical services to help them secure housing and safety.